American author and publisher whose almanacs and periodicals included the literary magazine, The Token which featured contributions by Nathaniel Hawthorne which formed the basis for his later noted book Twice-Told Tales." Under his pen name “Peter Parley,” he was a prolific writer of children’s histories and schoolbooks. This page is a correction for an earlier page which, by error, credited the quote to Joseph Paxton. The confusion was caused by a search result found for a Google Book with an incorrect cover image showing Joseph Paxton as author. That cover image was incorrectly shown for what was actually a book by “Peter Parley,” but that was the pen name of Samuel Griswold Goodrich. using pseudonym of Peter Parley in Peter Parley's Cyclopedia of Botany (1838). Samuel Griswold Goodrich was an American 19th century publisher of magazine and almanacs. Under the pen name of Peter Parley, he was a prolific best-selling author. His titles for children covered a wide range useful information topics. His 170 titles accumulated approximately 12 million books sold. “Botany,—the science of the vegetable kingdom, is one of the most attractive, most useful, and most extensive departments of human knowledge. 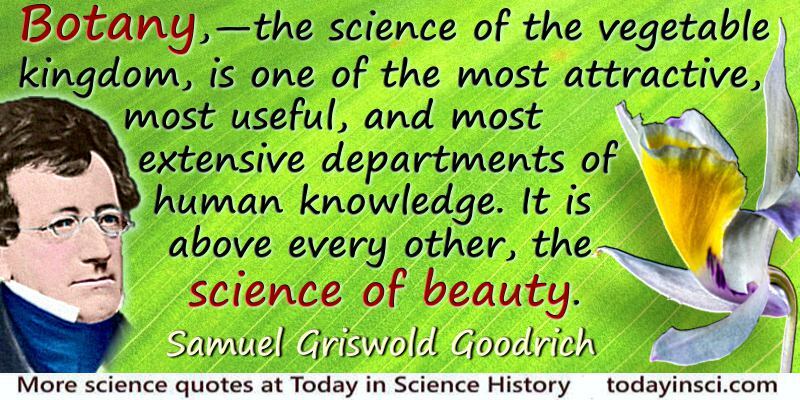 It is, above every other, the science of beauty. There are few plants, which are not beautiful, considered as separate individuals, and in all the parts of their individual organization; and there is a beauty in the grouping of plants, whether as grouped by nature, or by skilful art, to which there is nothing equal in that of any of the other productions of nature. The landscape is the object which mankind most generally admire; and the landscape owes its principal, if not its only charms, to its vegetation.